Welcome to Blessing, the fastest growing town in North Dakota and the friendliest. Living here in the Red River Valley, we have the richest farmland that grows fine wheat, along with hay and grain for the growing dairy herds here that support the Bjorklund Cheese Company, known all over the United States and even into Norway and other parts of Scandinavia. We now have an established flour mill, owned and operated by the Blessing Co-op, which also operates the grain elevator. Other businesses are coming to town. Elmer Grant and his wife have opened Grant's Groceries so now, The Mercantile established in our early days and owned by Penny Bjorklund sells all dry goods for both house and farm. The Blessing Bank, also part of the Co-op, has moved into the new building that houses the Barbershop and our new Post Office. We have a doctor in town with a surgery and we are searching for a dentist. The Blessing Boarding House is known from east to west as serving the best food west of Minneapolis--just ask any of the railroad men and the drummers and they will tell you. Besides our own public school with grades one through twelve, we have the Blessing Lutheran Church, both established in the early 1880's. You will also find the public library in the school building. Students come from around the country to the School for the Deaf, owned and run by Mrs. Lars Knutson, who is nationally known for teaching deaf people to communicate through sign language and learn skills for functioning in a hearing world. The Blessing Gazette is published weekly as of this year, including enough national news to keep us all well educated and all local news. If you would like to learn more about our town and its history, I have posted a timeline below for your study. You may also learn more about my family through the Bjorklund family tree. 1880- The seeds for the town of Blessing in Dakotah Territory were planted in the spring of this year, when two brothers, Roald and Carl Bjorklund, homesteaded with their families on the banks of the Red River and the Little Salt, now known as the Park River. A chicken coop was the first structure, followed by a sod barn and a sod house. Other settlers to follow were Joseph Baard and his family, and Abel Polinski and family, with soddies raised for them. Then came Pastor Solberg, who began holding Lutheran services in the Baard soddy, and Lars Knutson who arrived along with his machinery. 1882- The Lutheran Church was established and school was held in a soddy with various members of the growing community building desks, tables and Joseph Baard donated a stove. The church met in the same soddy. 1885- Haakan Bjorklund and Lars Knutson started a lumber mill, Ingeborg Bjorklund started making cheese to sell. More settlers arrived through the years. With the railroad moving in to the territory a sackhouse was raised for storing hundred pound burlap sacks of grain. Olaf Wold ran the warehouse. A train station is also built with a water tower for the trains. The telegraph line follows the railroad and opens in the train station. 1886-1887- Penny Sjornson Bjorklund opened The Mercantile. Hjelmer Bjorklund added a blacksmith shop onto his now wife’s Mercantile store. 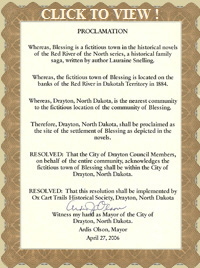 The settlement voted on a name and called their now town, Blessing. And the community formed a co-op and opened the First Bank of Blessing, run by Hjelmer Bjorklund and Mr. Valders. More houses and barns were raised as other settlers homesteaded the surrounding land. 1889- Bridget Bjorklund, mother of the three Bjorklund brothers arrives from Norway and decides to open a boardinghouse. The grand opening is July 3, 1889. Ingeborg Bjorklund builds a cheese house because of the growing popularity of her cheeses. Hjelmer adds a livery and machinery sales to his blacksmith. North Dakota becomes a state during this year, and Kaaren Bjorklund Knutson opens the School for the Deaf in her old soddy. 1890- Kaaren’s home is expanded and she becomes the Headmistress of a fast growing school for the deaf that draws students from around the country to learn the new sign language she teaches. 1892- When a new grainery is built by the Co-op, Olaf Wold turns the old warehouse into a furniture manufacturing plant. A dining room is added on to the boarding house and serves three meals a day to the general public as well as the boarders. More settlers come, some leave. 1894- The first class of seniors graduate at the Blessing school. 1897- the great flood nearly destroys the town, but the people of Blessing prove their mettle and rebuild. All text and images on this site are protected by copyright. You may not copy, modify, sell, distribute, transmit, display, reproduce, or publish any text or images from this site without the express written permission of PulsePoint Design and author Lauraine Snelling. Site maintained by PulsePoint Design.